The USS VIRGINIA (CGN-38), the first of the nuclear powered Virginia class cruisers, was commissioned on 11 SEP 1976. USS VIRGINIA was built by the Newport News Shipbuilding & Dry Dock Company in Newport News, Virginia. After extensive shake down sailing, VIRGINA underwent a extended yard period from April to September 1977. VIRGINA first crossed the Atlantic in August 1978 during a three month "North Atlantic". Over the following sixteen years, VIRGINIA deployed regularly to the "MED", Caribbean, and on into the Indian Ocean as the US Navy established a standing naval force in the Persian Gulf after the Hostage Crisis in Iran. USS VIRGINIA served her country for 18 years, 1 month and 30 days, until decommissioned on 10 NOV 1994. VIRGINIA was disposed of, along with her sister nuclear powered cold warriors, by the Puget Sound Naval Shipyard in 2002. The fifth Virginia (CGN-38) was laid down on 19 August 1972 by the Newport News Shipbuilding & Dry Dock Co. as a nuclear-powered, guided-missile frigate, DLGN-38; launched on 14 December 1974; sponsored by Miss Virginia S. Warner, daughter of the Honorable John Warner, former Secretary of the Navy; reclassified a nuclear-powered, guided-missile cruiser and redesignated CGN-38 on 30 June 1975; and commissioned on 11 September 1976, Capt. George W. Davis, Jr., in command. During the first six months of her commissioned service, Virginia ranged the eastern seaboard of the United States and cruised in the West Indies several times conducting a myriad of post-commissioning tests and shakedown training. On 25 April 1977, she entered the Norfolk Naval Shipyard for a five-month, post-shakedown availability. She completed her final sea trials on 28 September and began duty as an operational unit of the Atlantic Fleet. In November, she cruised along the New England and Canadian coasts, participating in antisubmarine warfare exercises. In December, she returned to the West Indies for missile firings on the Atlantic Fleet weapons range. She completed that mission on 13 December and reentered Norfolk three days later to begin holiday leave and upkeep in her home port. The beginning of 1978 found her still in Norfolk; but, by mid-month, she returned to sea in the Virginia capes operating area for a series of local operations. On 28 January, however, she departed Norfolk to return to the area along the Florida coast and in the West Indies for a series of special tests conducted under the auspices of the Office of the Chief of Naval Operations. The guided-missile cruiser returned to Norfolk on 23 March and resumed local operations. That employment lasted until 23 August when she embarked upon a cruise to northern Europe to participate in Operation "Northern Wedding," a NATO exercise the purpose of which was to test the ability to reinforce NATO forces in western Europe. During that deployment, she visited Oslo in Norway, Rotterdam in the Netherlands, and Portsmouth in England. The warship departed the latter port on 3 October and reentered Norfolk on the 12th. On 16 November, she put to sea for training exercises in the Gulf of Mexico. During that voyage, she made a port visit at Mobile, Ala., and conducted naval gunfire support training at Vieques Island near Puerto Rico. She made another port visit to the island of St. Thomas on 6 and 7 December before heading home. 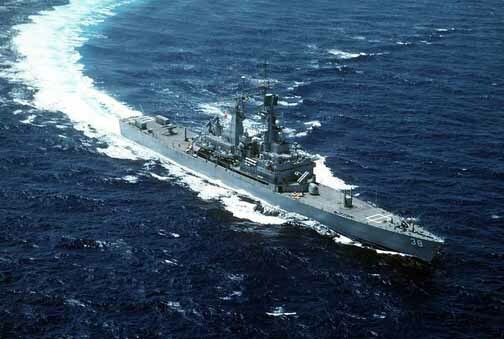 Virginia reentered Norfolk on 11 December and began preparations for her first deployment to the Mediterranean which was scheduled to commence in early 1979.